Click here to read the first part of this series of articles. They need to be read in the correct numbered sequence to be best understood. ........14 And God said, ‘Let there be lights in the dome of the sky to separate the day from the night; and let them be for signs and for seasons and for days and years, 15 and let them be lights in the dome of the sky to give light upon the earth.’ And it was so. 16 God made the two great lights—the greater light to rule the day and the lesser light to rule the night—and the stars. 17 God set them in the dome of the sky to give light upon the earth.....................and let birds fly above the earth across the dome of the sky." Genesis 1:6 introduces an immense problem for Christadelphians. What is the "Dome" referred to as created by God in the New Revised Standard Version; or "Vault" in the New International Version; or "Canopy" in the International Standard Version; or "Firmament" in the King James version? How could it separate and suspend an entire ocean of water above the Earth from the oceans below? How many trillions of tons of weight of water would it have to support to prevent it crashing down on the planet? How could it be possible to set the Sun, Moon and all of the stars and hundreds of thousands of billions of galaxies in the entire universe "in" the dome that supports the ocean that is suspended in outer space? Finally; how was it possible for the birds to fly "across the dome?" That would mean that the dome was set so low above the Earth that birds could fly up to it. The Hebrew reads "across the face of the dome." Needless to say, this section of Genesis contradicts all that modern science teaches us about cosmology. We know that what we are being told here in the Bible is impossible. There never was an ocean in space, held up by a dome that contained all of the stars that birds could fly up to and visit! 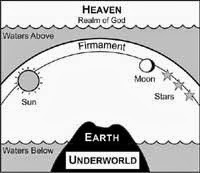 But it would have all made perfect sense to the pagan Sumerian priests who invented the story of a sky dome holding up an ocean of water floating in outer space, over a thousand years before Genesis was written. They would have recognised the story as their own. They would not be fooled into thinking that the Hebrew God inspired the narrative; because they would have known that they inspired and invented the story themselves. In the first part of this series we noted that the Sumerian God Enlil separated the Earth from the Heaven, which were originally united. For example in the Sumerian myth "The Creation of the Pickaxe"
This is what was happening in Genesis 1:6. 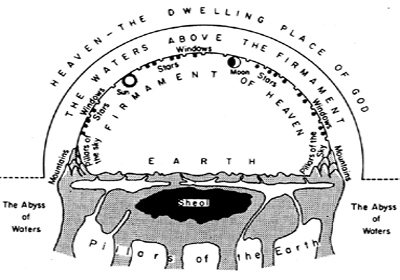 The dome or firmament was lifted up to separate Heaven from the Earth. The Sumerians believed that the sky was a solid object, probably made of tin. Their word for tin was "Metal of Heaven." All of the ancient peoples believed that the sky was solid and that it was a dome that arched over the Earth, which they thought was flat and reached down at the sides. It was not until approximately the year 200 AD in China and 1550 AD in Europe that civilised peoples began to realise that the sky was not a solid object. They believed that the Sun Moon and stars were set in the solid dome or moved underneath it. Click here for an excellent essay on this subject if you are interested in further study on the subject of the solid sky dome in ancient cosmology.. The Hebrew word for "Dome" or "Firmament" in Genesis is "Raqia." It's verb means "to beat out" or "to spread out" as one might beat out a piece of tin to form a bowl. The word "firmament" ("Firm" - ament) implies a "firm", solid material, coming from the Latin word "firmamentum," from Jerome's Latin Vulgate translation of the Bible. The Latin word firmamentum has the meaning of a "support," or "prop." "And the likeness of the firmament upon the heads of the living creature was as the colour of the terrible crystal." - Ezekiel 1:22. "And above the firmament that was over their heads was ......................the likeness of the glory of the LORD." - Ezekiel 1:26-28. Genesis claims that it was created by the Biblical God! In those days mirrors were not made of glass but of metal. Job is telling is that God spread out the sky like a hard, solid, metal sheet; which is the dome or firmament conceived of by the Sumerians and a concept copied by all ancient peoples; including the writers of Genesis. Of course it is all nonsense. If there were a solid dome in the sky, our space rockets would crash into it. The writers of Genesis had no more idea what they were talking about than the pagan Sumerian priests who invented the idea. It is further evidence that Genesis is not an anti-pagan polemic, or an account of how God created the world. Genesis is reworked pagan myth, legend and faulty cosmology with the names of the Hebrew God substituted for the pagan gods to fool the Hebrews into thinking that their God was the creator. an ocean in outer space! 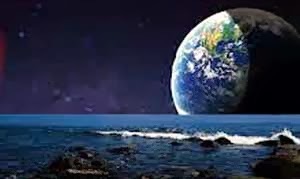 But even more bizarre than the idea of a solid dome in the sky, is the claim in Genesis that God took half of the water on Earth and created an ocean in outer space above the firmament. We know that this is also nonsense and that there is no sea in the sky and no evidence that there ever was. The Genesis writers must have lifted the idea from earlier and original pagan creation myths and worked it into the Hebrew creation story. 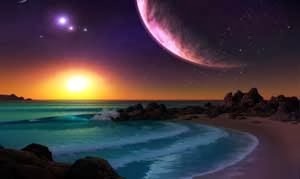 The idea of an ocean of water above the dome of the sky was so strange that so far as we know, it was not a common belief in the ancient world. If a primitive human looked up at the sky, either in the day or night, he might well have concluded that it was a solid dome stretching down to the horizon. But there was nothing to be observed that might make him think that there was a sea above the sky. Nevertheless, the mystery of where the Genesis writers gained their inspiration has been solved. It was not from God; it was from Sumer. In 1849, the English archaeologist, Sir Austen Henry Layard, while working in the ruined Library of Ashurbanipal at Nineveh in Iraq, discovered seven clay cuneiform tablets with approximately one thousand lines of text of a pagan Mesopotamian creation story. They were translated and published in 1876 by George Smith. Other fragmentary copies have since been discovered at other locations including one from Turkey. Parts of the story are still missing. 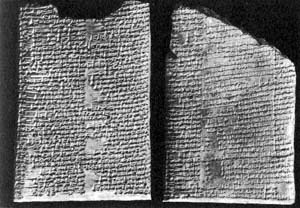 The version from Ashurbanipal's library dates to the 7th century BCE; which would coincide with the Jewish exile in Babylon which is when Genesis is thought to have been redacted and edited together into its final format. So the Hebrew Biblical scribes could have been familiar with Enûma Eliš. Layard's version of Enûma Eliš is certainly a copy of copy of a copy going back many hundreds of years. Some scholars believe that the original story must have been composed about the time of Hammurabi (approximately 1,800 BCE) which puts it back into Sumerian times. But whenever it is dated, it is pagan and pre-Genesis. 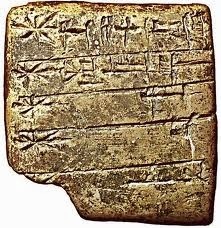 Called the Enûma Eliš, the tablets contain numerous parallels with the Genesis account of creation. they are written in a complex form of poetry; rather like the Genesis 1 account. The second parallel is the start of tablet one where before the beginning of creation the god of fresh water and goddess of salt water are mingled together in a primeval sea; just as Genesis begins with "the deep" and the Earth is "without form and void." But it is the third parallel that is of most interest to us. At the end of tablet four, Marduk kills the goddess Tiamut, the goddess of seawater, who was herself a vast body of seawater, divides her waters in two and creates heaven and earth from the two halves. But because she is seawater, he took precautions to ensure that her half that became an ocean in outer space, did not rain down to Earth. In Genesis it is the dome, or firmament, that divided the waters and created a solid dam to prevent the waters in space from falling to Earth. 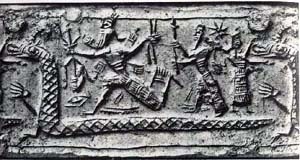 In Enûma Eliš the author used imagery of the god Marduk fixing a "bolt" as if locking a door and stationing a watchman to prevent the heavenly waters escaping. But the idea is the same. Half of the waters from Earth were taken up into heaven and prevented from falling down to the Earth. These are the pagan origins of the solid sky dome created by God in Genesis 1:6 and the extra terrestrial ocean of Genesis 1:7. If we had more clay tablets we would surely know more about these pagan origins of a book that the Christadelphians think is divinely inspired. Let us hope that the work of archaeologists will continue to uncover the truth and expose the myths contained in the Bible.